Stuart England: history of britain in the time of the stuarts. When Elizabeth died, James the First became the English king. He was already the king of Scotland, and united Scotland with England and Wales. He ordered a new translation of the Bible (the Authorised Version) which remains popular in England today. He tried to force Catholics to go to Protestant churches. A group of Catholics planned to blow up the Houses of Parliament when James was there (on 5th November 1605): this was known as the Gunpowder Plot. But the plan was discovered and one of the group called Guy Fawkes was caught and burnt alive. On the 5th November every year, people celebrate the failure of the Gunpowder Plot by burning a straw man (known as a Guy) on a fire, and by having a display of fireworks. James was followed by Charles the First. He argued with Parliament, particularly about taxes. Many people in the Parliament were Puritans, who wanted the Church of England to adopt a simpler style of worship without bishops and formal ceremonies. Some Puritans known as the Pilgrim Fathers travelled to America to Massachusetts so that they could settle there and follow their own religion freely. Meanwhile, Charles decided that bishops should rule the Scottish Church (the Presbyterian Church), but the Presbyterians did not accept this and created an army to attack England. Charles stopped the attack by paying money, but needed the help of Parliament to raise this money. 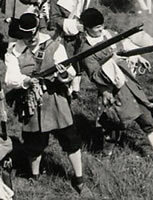 There were more disagreements, and fighting began between Royalists (known as Cavaliers) who supported the king, and Parliamentarians (known as Roundheads) who supported Parliament. This was known as the English Civil War. 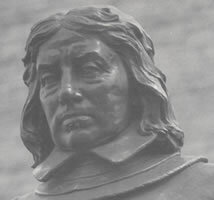 One of the main leaders of the Roundheads was Oliver Cromwell (his statue can be seen in Parliament Square in London, opposite the Houses of Parliament). 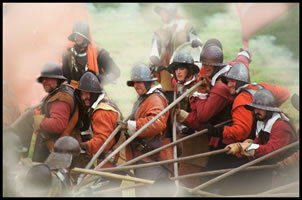 The Cavaliers were defeated at the battles of Marston Moor and then at Naseby. Charles escaped, but was later caught and his head was cut off. His son, also called Charles, is believed to have escaped from Cromwell's soldiers by hiding in an oak tree. 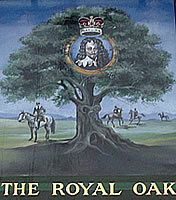 Pub names such as the King's Head or the Royal Oak are based on these events. 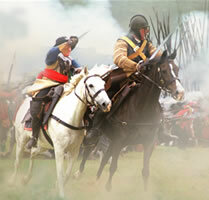 There is a society called the Sealed Knot (http://www.sealedknot.org) who put on reconstrctions of battles from the English Civil War period. Parliament ruled without a king and without a House of Lords for 11 years (this period was known as the Commonwealth). However, Scottish, Irish and other European countries supported Charles (the son of Charles the First). Cromwell went with an army to Ireland, where he killed many Royalists and tried to restrict the freedom of Catholics. Taxes were increased and Cromwell became unpopular. Cromwell died soon afterwards, and when Charles returned from abroad he was accepted as king (Charles the Second). London was the largest city in Europe by this time, but the streets were dirty and narrow. In 1665 there was another spread of disease in London and the south of England known as the Great Plague, and then in 1666 much of London was destroyed by the Great Fire of London. A large stone column known simply as the Monument was put up near the place where the fire had started. After the fire many of the old buildings which had been made from wood were rebuilt using stone or brick. New churches were built based on designs by Sir Christopher Wren, including Saint Paul's Cathedral (see: http://www.stpauls.co.uk). A lot has been learnt about life in London at this time from the diaries of Samuel Pepys. Charles' brother became the next king, James the Second. He was a Catholic and tried to change some of the laws against people who were not Protestants. 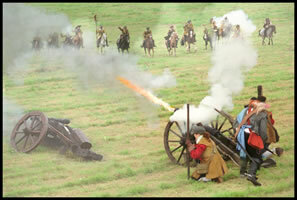 The Duke of Monmouth tried to lead a revolt against him, but lost at the battle of Sedgemoor in Somerset. James soon became unpopular, however, and was replaced by William and Mary (Mary was James' daughter and William of Orange was her husband, a Dutch Protestant prince). James escaped to France and then raised an army in Ireland, where he was supported by the Catholics. The Protestants in Ulster (part of Ireland) supported William of Orange. James was finally defeated at the battle of the Boyne, a victory which is still celebrated each year by marches through the streets of Ulster by the Protestant Orangemen. During the reign of queen Anne, the Act of Union united Scotland and England and Wales, creating Great Britain.